Electrical engineers have a demanding job, and one of the demands of the current industry is effective labeling. We help you get the job done right, with vinyl arc flash labels that will last for years, even in the toughest environments. Our complete arc flash packages are designed to give you exactly what you need to get your arc flash analysis done right; And to help you get started quickly, we offer free advanced tech support. We realize that you don't have all day to get your arc flash labeling tasks complete. That's why we've developed a combination of high-speed hardware and supplies, capable of making your labels in seconds. 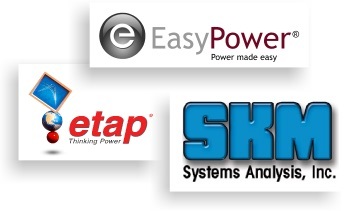 Print directly from SKM, ETAP or EasyPower, without intermediate steps! Once your calculations are complete, the labeling part is easy: just print it and go. No one beats SafetyPro for speed, affordability and quality. Our new line of UV Protected labels will outlast any outdoor label on the market! There is no limit to what you can label- it's up to you! Use these kits for your arc flash projects, then expand to include any other labeling project you have at your facility. Arc flash hazards are serious business- and SafetyPro is a serious labeling machine! Our arc flash labeling packages offer the right materials, and the right equipment, to get the job done. Our arc flash label printers are compatible with SKM, Etap, EasyPower, and more. Print directly from your calculation labeling software, and get the arc flash labels you need instantly. Get started on your arc flash labeling project with this high-resolution 600dpi SafetyPro Evo6 starter package. Works with SKM, Etap, EasyPower, and more. Get started on your arc flash labeling project with this basic starter package. Works with SKM, Etap, EasyPower, and more. Get started on your arc flash labeling project with this UV-protected starter package. Works with SKM, Etap, EasyPower, and more. Get more labels, in the most useful combinations for all your arc flash labeling tasks. Works with SKM, Etap, EasyPower, and more. Get more labels, in the most useful combinations for all your arc flash labeling tasks. UV-Protected for longer outdoor label life. Works with SKM, Etap, EasyPower, and more. Get more labels, in any combination you choose, plus the benefit of High Performance outdoor rated formulations. Works with SKM, Etap, EasyPower, and more. High Performance mixed with Peak Performance extra-long-life labels for ultimate flexibility. Works with SKM, Etap, EasyPower, and more. Got a big arc flash labeling project, with outdoor labeling requirements that need to last longer? Get the Peak Performance kit, and you'll be ready for anything. Works with SKM, ETAP and EasyPower... and more! Our kit works with, and is often recommended by companies like SKM, ETAP and EasyPower! All three have been tested with and validated for the SafetyPro 300 printer, and are used by thousands of arc flash engineers for label printing in every part of the world! The SafetyPro 300 comes with a universal print driver for SKM, ETAP and EasyPower, so you don't have to worry about compatibility. Need help with an arc flash study? Get arc flash help today. World class technical assistance, free! You won't get better technical support anywhere. We can help you through every step of arc flash labeling printing, from loading your printer and setting up your universal SKM, ETAP and EasyPower print driver, all the way through to printing. Tech support is always free with SafetyPro, so you don't have to worry about support contracts or warranty periods; as long as you're our customer, we'll make sure you can get the jobs done right.